Although a cereal company using a fake psychic to promote a faltering brand sounds like some magnetic poetry, that’s exactly what’s happening in a Florida courtroom. TMZ shared the story with a gibberish headline, but it appears that the Psychic Readers Network, a company that once paid a $5 million fine for fraudulent practices, is suing General Mills, a company that once sold French Toast Crunch (and is marketing it again). 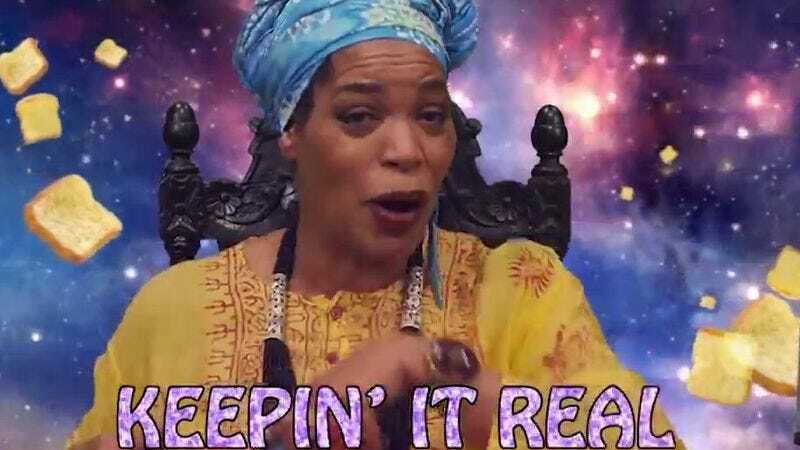 PRN is suing General Mills over its advertising campaign featuring Miss Cleo, a fake psychic from the ’90s whose likeness is owned by the fake psychic network. People paid by the minute for supernatural counsel from Miss Cleo, whose real name is Youree Dell Cleomili Harris. She became the face of PRN, who promoted her aggressively. The company racked up the 900 numbers and billed minutes as desperate people called to ask for Miss Cleo’s advice on everything from love to finances. The whole thing came crashing down in 2002, when the FTC ordered PRN and its affiliates to waive $500 million in outstanding charges, but not before they had already collected on the other half of a billion dollars. We remember all this, so you’d think a huge company like General Mills would, or at the very least ask its lawyers to look into it. But according to the Sun Sentinel, the cereal company was inspired to hire Miss Cleo in order to feed millennials’ nostalgia for things like fake psychics. (We guess we missed all the references to the Jamaican mystic on Girls and those lip-sync battles.) The company apparently believes it can sell its cereal by using a well-known fraud to cheerfully predict your eating (and purchasing) it. We get it, younger generations will occasionally revive bygone cultural phenomena, but this just sounds like a non-starter. And it seems General Mills already knew that, because their social media accounts are pretty light on the Miss Cleo ads. Although the brand’s Facebook page shared a photo of Miss Cleo with the caption “favorite ’90s icon” (somewhere, David Arquette is sobbing), the commercials aren’t posted anywhere. The Twitter accounts for the company and brand are similarly devoid of these breakfast prediction spots, instead promoting some weird mini-soap opera campaign. The complaint itself is pretty straightforward: PRN copyrighted what they call the “Miss Cleo Creatives,” which are her likeness and pseudo-psychic personality, at the height of their popularity. PRN is seeking damages in the amount of all of the profits resulting from the advertising campaign. General Mills did not receive the proper authorization to use that—and we use the term lightly here—intellectual property, so they should probably have to pay. But something about this suit just sticks in our craw (much like some overly dry cereal).